As you may remember, my hunka hunka burning love and I celebrated our one year wedding anniversary last Monday. Brad was pretty serious when it came to the keep-your-wedding-cake-topper-in-the-freezer-for-a-year-and-then-eat-it tradition. I had a feeling the cake would taste like it had been in a freezer for a year so I ordered a fresh, 8″ cake from a local bakery. You know, just in case. When we got the original topper out of the freezer it looked like a younger version of Miss Havisham’s wedding cake. Fresh cake topper it was. I thought I should jazz it up a bit with some bunting since it was our one year anniversary after all. The bunting was crazy easy to make. 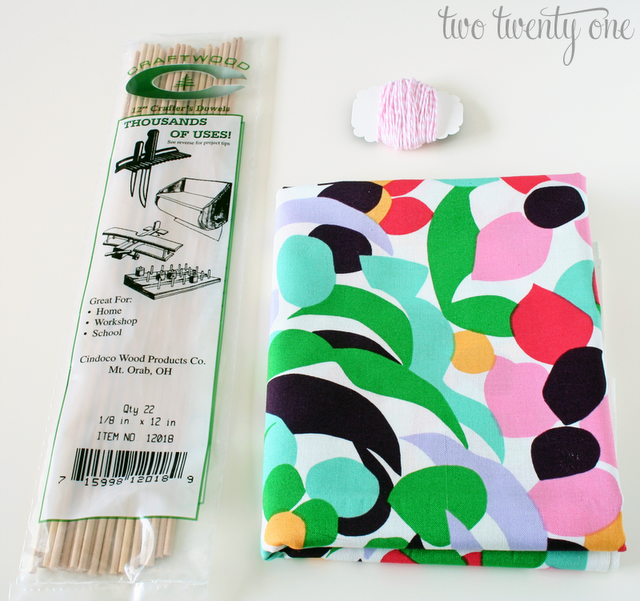 I grabbed some fabric (from JoAnn Fabric), two dowel rods (JoAnn), and bakers twine (eBay). 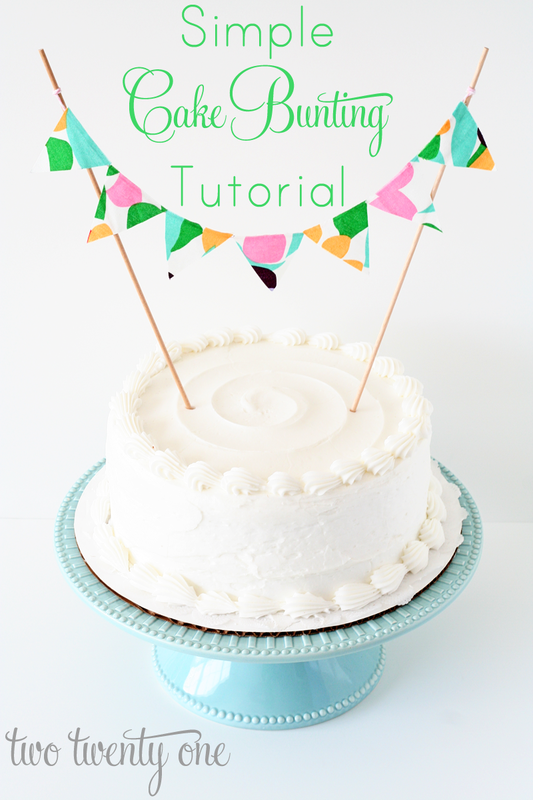 If you don’t have bakers twine on hand, you can substitute with embroidery thread or yarn. To make sure all of my triangles were the same size, I used a template. I cut out one template piece and traced half of it onto the fabric and cut it out. My cake was an 8″ round, so I went with seven triangles. Then I grabbed out my bakers twine and hot glue gun. I turned the triangles over and glued them onto the twine. Don’t over do it on the glue. After all seven triangles were glued onto the twine, I put a dot of glue about one inch from the top of one dowel rod. I wrapped the twine around a couple times, trimmed it with scissors, added another tiny dot of glue, and secured the end of the twine to the dowel. I repeated this step with the other dowel. I’m a big symmetry-liking nerd, so I measured in 2 inches on each side of the cake and placed the dowels accordingly. Real quick before you go– walk down memory lane and gaze longingly at our original wedding cake with me. Man, I loved that cake. Did you partake in the keep-your-wedding-cake-topper-in-the-freezer-for-a-year-and-then-eat-it tradition? If so, how did it taste? 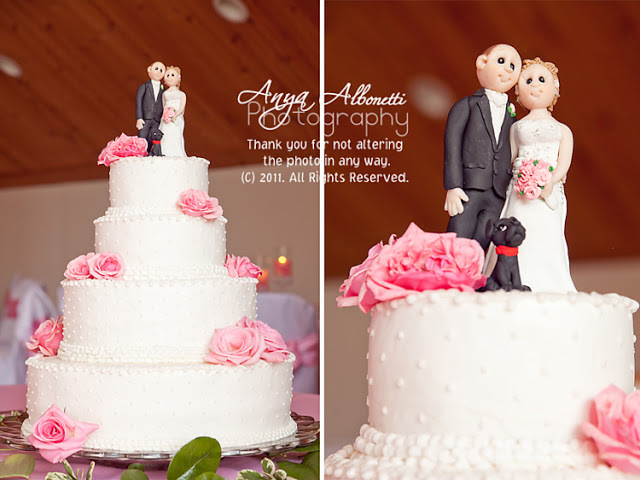 Or did you buy a new cake topper? If you didn’t do any of this because you hate cake, then I think you and I need to reassess our friendship. Want to see more tutorials from yours truly? Click here. Looks great! We ate our cake topper the day after our wedding! Ha! But to be fair, we didn’t get any cake on our wedding day (other than the piece we fed each other for photos)….and I knew it wouldn’t keep for a year! We’re hoping to freeze and eat our top layer – but we’ll see. In all honesty, we’ll probably forget about it and remember a week after our anniversary. haha. Love the cake bunting – super cute. And your wedding cake topper is great too. We kept ours and I have it displayed in our living room (you can see it here: http://www.aswellplacetodwell.com/2012/03/cornbread-end-table.html ). It’s from lollipop workshop on etsy – they have the cutest things! The hardest part is keeping our daughter away from it. She wants to play Mommy & Daddy all the time! We ate ours on our 3 month anniversary haha. Everyone said it would taste like a freezer by one year, but at 3 months it was pretty tasty! That is so cute! We had cupcakes at our wedding and bought a small Oreo cake to go on the top for us to cut. Our plan was to just buy an Oreo cake for our anniversary instead of eating old frozen cake, but naturally Oreo stopped making the regular cakes and only makes ice cream cake now. I just bought a mini chocolate cake on my way home and we had that instead haha. 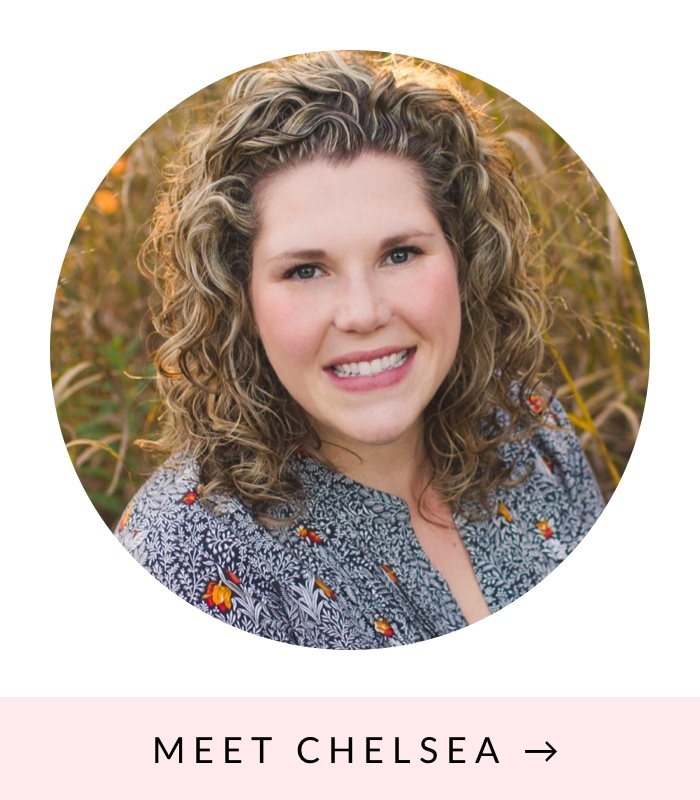 I love this, Chelsea! 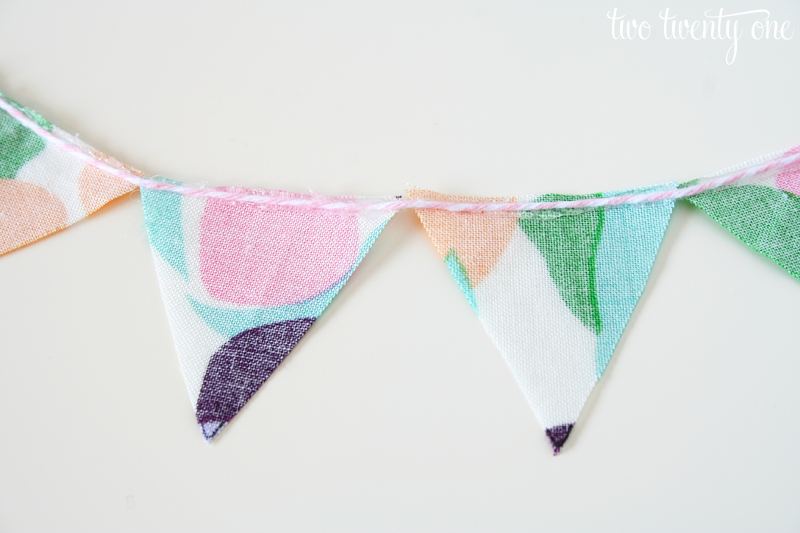 Bunting is one of my favorite things! 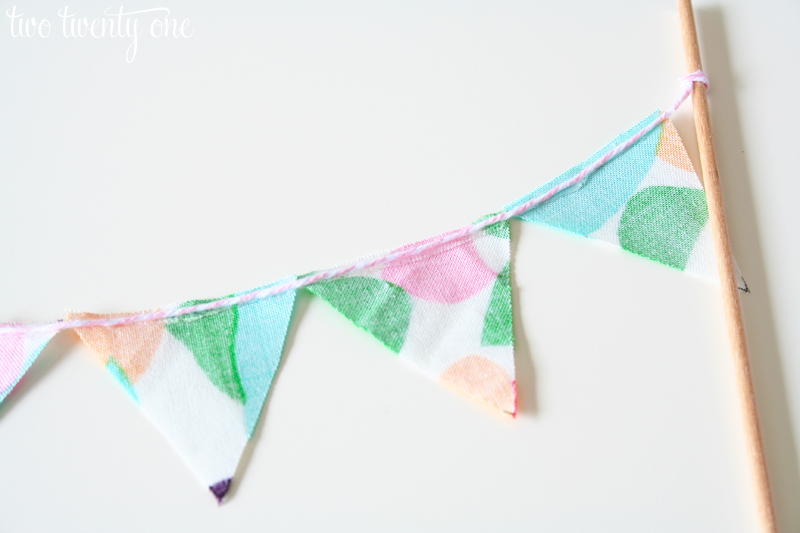 Cute cute cute bunting!!! I love it and super simple too. Right up my ally! We saved our cake topper and vacuum sealed it and to be perfectly honest? It was just as good as the day we got married! I was glad we kept it! I’m glad yours kept well! Clearly, I should invest in a vacuum sealer. This is ADORABLE!!! And love your cake topper!! So stinkin’ cute. Very cute and so easy!! It really jazzes up your cake! This is super cute! Loving the color scheme you chose! 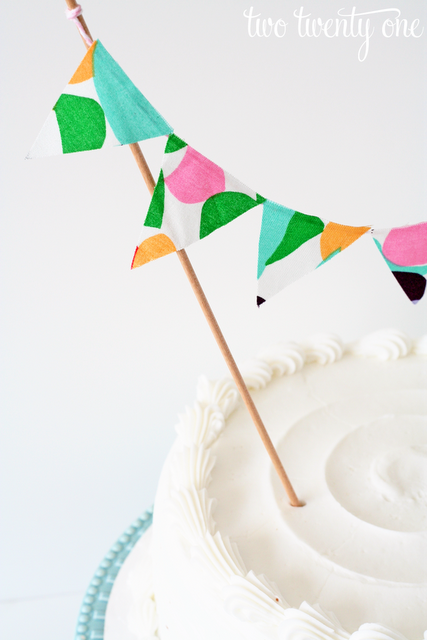 I just love these buntings especially on cakes….so cute! New follower! this article. It was helpful. 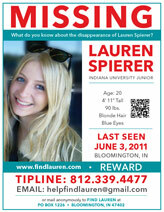 Keep on posting! 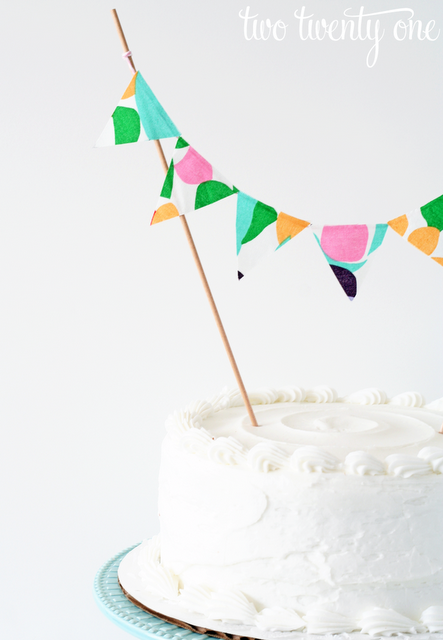 Hello, I just love your cake topper bunting. I want to make one for my wedding but unsure what size (ply) I need for the bunting. Can you tell me what size you used? An individual fundamentally help to make drastically posts I might declare. This can be a new I actually frequented your site page and so considerably? We impressed together with the evaluation you’ve made to create this particular publish awesome. Wonderful task! I really enjoy looking through on this site, it contains fantastic posts. enjoyment, as this this web site conations really pleasant funny data too. Only wanna input that you have a very decent web site, I enjoy the design it actually stands out. this topic to bee reaply something thjat I think I would never understand. I will try to get thhe hang of it! It’s really a njce aand useful piece of information. I’m happy thast you shared this helpful information with us. tto read everthing at one place. i was just wondering iif you get a lot of spam comments? Thank you a bunch forr sharing tthis with all people you really recognise what you’re talking about! Bookmarked. Kindly additionally seek advice from myy site =).